Bathrooms come in many shapes and sizes and have evolved so much that newer executive homes are built with bespoke shower and bathroom units. Bathroom shower-heads therefore tend to be higher than they used to be. 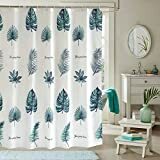 Some standard shower curtains are no longer enough to fit modern high-ceiling bathrooms and that's where you must shop around for extra long curtains for wet rooms and bathrooms. These type of curtains are a great choice for bathrooms that are used by children or senior adults because they reduce the chances of slipping and getting injured and ensure that all the water stays inside the shower unit or wet room. Keeping your shower area dry protects your floor from damage. Consider using extra-long shower curtains if you want to improve the lifespan of your bathroom floors. 2 What is the length of an extra-long shower curtain? 3 How long is an extra long shower curtain liner? The below product is one of the best selling extra long shower curtains you can buy. With a massive range of sizes available, plus free shipping for prime members and anti bacterial treated this curtain is rated as the best all round for 2019. If your bathtub does not look great, extra-long curtains may cover it up and improve its appearance. The curtains come in plenty of patterns and colours so you can always find something to suit your preference. If you are a tall person, you may need to turn your shower head upwards. With a standard curtain, it may cause water to splash all over the floor. An extra-long curtain is higher than the showerhead so it suits tall people. Choose your curtain's colour and material to suit the functional and decorative needs of your bathroom. What is the length of an extra-long shower curtain? Extra-long shower curtains are different from standard curtains because of their length. They are about one foot longer than standard sized curtains. While the average size of a standard curtain is 70 to 72 inches, an extra-long shower curtain is about 84 inches in length. The point of using a shower curtain is to keep water from getting on your bathroom floor or wet room. If you have a modern, high-ceiling bathroom, extra-long shower curtains are a great choice. Some of the popular sizes in the UK include; 84" long x 72" wide and 96" long x 72" wide. Some things to consider when buying your longer curtains include the size, brand and colour. You can use them to add style into your bathroom since there are different textures in the market from vinyl, polyester or for added luxury silk or satin. If you plan on redecorating your bathroom, take some time to think about what you want. Buy an extra-long curtain depending on the size of your bathroom and get away from the monotony of regular bathrooms. 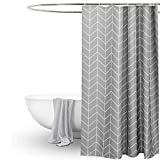 Take a look at the geometric patterned extra long shower curtain with superb features and a relaxing pattern. How long is an extra long shower curtain liner? Do not underestimate the importance of your shower curtain liners. They are just as important as your shower curtains even though they may not be the centre of your bath décor. If you do not have the right shower curtain liner you may end up with mould on your shower curtains - so buy curtain liners of decent quality if you hope to improve the lifespan of your curtains. Standard curtain liners may be about 70" by 72" and extra-long curtain liners are usually 144" by 72". 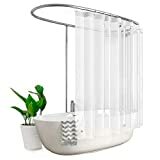 This shower curtain liner is top rated because it has so many winning features like heavy magnets to keep the liner in place, anti-bacteria / anti-mold material all at a cheap price. When choosing the liners, it is important to remember that those whose hems are weighted by magnets are more likely to stay in place than those without liners. Those with suction cups at the bottom may help protect your floor. Extra-long shower curtain liners may help to stop the growth of mildew by keeping your shower area dry. They prevent the build-up of bacteria especially if your bathroom is not well-ventilated. Your extra-long shower curtains can double as shower curtains. If you want to keep your bathroom décor simple, pick a liner of your preferred colour and use it as a shower curtain. Clear liners are not appropriate in this case. Walk in showers are modern bathrooms made in an almost open-plan style. The stylish bathroom design is different from other shower enclosures because it does not have any doors. It maximises on space and provides an amazing showering experience. The shower cubicle has a shower tray and screen so you walk right into the shower without going through any doors. This design is appropriate for any room and one of the benefits of these showers is that they are much easier to clean than the porcelain of regular shower interiors. These bathrooms do not hold on to dirt like traditional ones. The Extra-long shower curtains are great for these bathrooms because they reduce the build-up of mould and dirt. You, therefore, do not need to change the curtains often. Walk in showers create an openness that feels and looks great. You can use them to complement the rest of your home but make sure you purchase decent products as they look better and last longer. If you are looking for a traditional style, walk-in showers can work just as well. It all depends on the textures and colour of your extra long shower curtains for wet rooms and bathrooms. All of our listed products have excellent reviews and are our recommended choice for 2019. 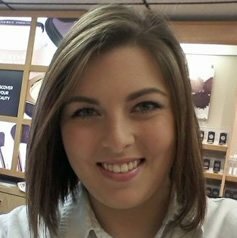 Welcome to Textile Futures, my name is Carla and I hope you enjoy reading the articles posted on the website.